The following is an excerpt from the December Margie’s Muse. Readers often ask “what is a color that is flattering to anyone and everyone?” I never believed there was one because people are so very different and millions of colors, shades, tones, tints, and intensities abound in fabrics and beads. I decided to learn what others have to say about this, and lo and behold, the Real Simple website has an interesting feature on the subject… complete with photos! 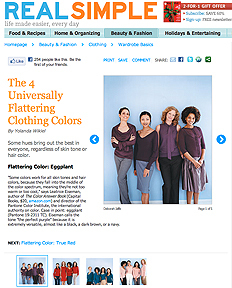 It is the photos that make the article worth devoting a column to: four photos show four differently colored women in what Real Simple calls “The 4 Universally Flattering Clothing Colors.” The pictures do support the thesis, though four skin/hair colorings is a small sampling. However, I applaud Real Simple for the photos: these kind of claims are usually accompanied by no support photos and just a written description of a color, which is of no help to anyone. I’ve made swatches of the four colors (and a light and dark version of two). They are in my PDF article that corresponds to this blog post. Please read the Real Simple article. And tell me what you think. My opinion? For those of us who make jewelry to sell to the ubiquitous Unseen Customer, these four colors provide a launch pad and give us a little more confidence that our color selections will fit someone. The most promising colors are Eggplant and Indian Teal: they are muted versions of appealing, sophisticated colors. I would use them first when making jewelry for my Unseen Customer. True Red is the wildcard. A strong, striking color, it looks fantastic on many people. The article quotes Bill Blass as saying “When in doubt, wear red.” It lends power and allure to the wearer. But everyone? I’m wondering how the palest, blondest woman would stand up to it. I find Mellow Rose questionable, as I know many women and men whose faces would look washed out by this pale, gentle tint (including mine). Read more Margie’s Muse in the archives. I completely agree with you about the Mellow Rose. No way would I be able to wear that. I had always heard that the one color everyone can wear is turquoise but that wasn’t even on Real Simple’s list. Teal is a dark version, I guess! It’s very interesting! Yes, Sally, turquoise, depending how much green is in it and how much yellow is in the person’s skin, is flattering to just about anyone. I was surprised that it wasn’t included in the article. Thank you for reading and responding.